In the fall of 2017, students from the Community College of Philadelphia visited 425 Lombard Street to conduct research. In preparation for the Society's first collaboration with an entire CCP class--part of a long-term effort to use the archives' primary-source materials to bolster student research and problem-solving skills--Technical Services and Reference Archivist Jennifer Barr worked closely with CCP Professor Joel Tannenbaum. Their planning included familiarizing students with the archives (building spaces, staff members, collection materials, and research procedures), creating a scheduling process for students to reserve times for individual research visits, and preparing PHS archival staff to assist students with the exciting but sometimes daunting work of investigating documents created by historical figures--in this case, missionaries, ministers, publishers, and social justice advocates whose words and actions shaped 19th century American life. Tannenbaum and Barr worked with PHS Director of Programs and Services Nancy Taylor to select document sets that connected with themes from the class's U.S. History 102 discussions. More than 70 collection items from the 19th century were included in the 6 sets, which included "The Right to Vote," "Education and Literacy," "Immigration," "Slavery," "Territorial Expansion," and "Abolition and Colonization." By the end of the semester, 29 CCP researchers had explored those items first hand with the help of PHS reference archivists and submitted research essays that used the collection items as thesis supports. This spring, Barr will blog about her experiences working with CCP students and instructors--including this semester's visiting CCP class, African American History 220. For now, we'll leave you with two exemplary essays from last semester's collaboration. To read them, click on the links in the paragraph below. Cover pages of two student essays, November 2017. Courtesy of Mancini and Brown. The essay on the left was written by Maggie Mancini, a first-year Communications student who plans to attend Temple University as a journalism student. 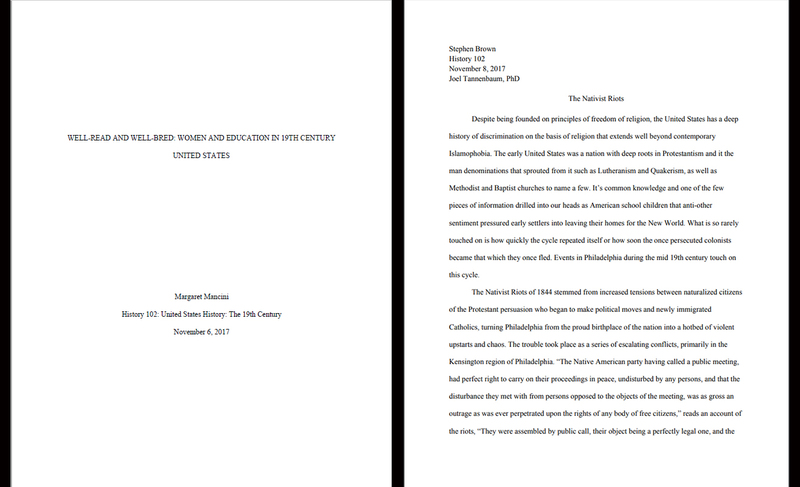 The essay on the right is by Stephen Brown, an English major from Moorestown, New Jersey, who is also planning to transer to Temple. Thanks to Maggie, Stephen, and the other History 102 students--and to Professor Tannenbaum--for making last fall such an enjoyable teaching and learning experience for all of us at PHS. Interested in finding out more about PHS's classroom opportunities? Please contact Fred Tangeman. 11 hours 50 min ago. Today’s #HistoricalFigureFriday honors Reverend James Patriot Wilson. Born in 1769 in Lewes, Delaware Wilson went on to graduate from the University of Pennsylvania in 1788. He initially studied law and was admitted to the Bar but the unexpected death of both his wife and brother led him to a religious path. He was ordained as pastor of the Presbyterian Church in Lewes in 1804 and in 1806 he accepted a call to lead the First Presbyterian Church in Philadelphia. He resigned as a much celebrated pastor in the spring of 1830 before he died December 9th 1830. Our portrait of Reverend Wilson was painted in 1807 by none other than James Peale the younger brother of Charles Willson Peale. This oil on canvas painting represents one of the many large portraits James Peale completed after he shifted away from miniatures. To see more works by James Peale visit PAFA The Pennsylvania Academy of the Fine Arts or the Philadelphia Museum of Art.